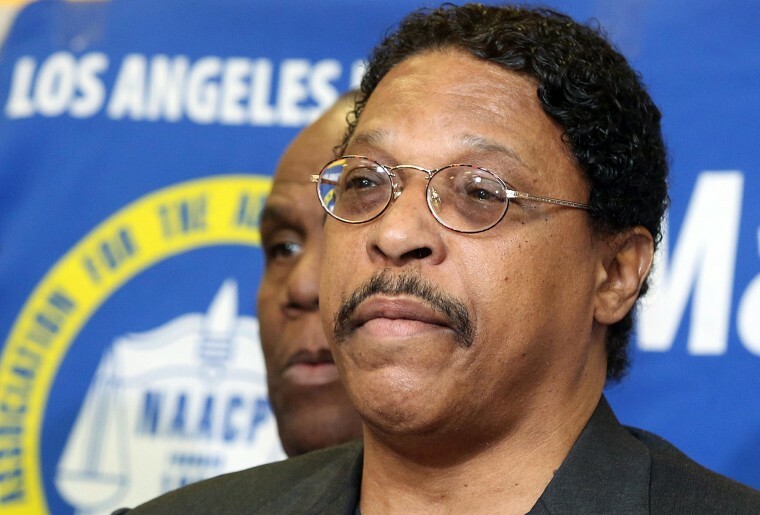 The president of the local NAACP chapter resigned Thursday amid the backlash over its since-rescinded plans to give a lifetime achievement award to Los Angeles Clippers owner Donald Sterling. "The legacy, history and reputation of the NAACP is more important to me than the presidency," Leon Jenkins, president of the Los Angeles chapter, said in a brief statement late Thursday. Jenkins said he made his decision to "separate the Los Angeles NAACP and the NAACP from the negative exposure I have caused the NAACP." Jenkins and his chapter of the national civil rights organization have been under fierce scrutiny since it emerged that it was to have given its highest honor to Sterling, whom the National Basketball Association banned for life after he was taped making racially offensive comments. The organization canceled the honor Monday. Jenkins' resignation comes as a committee of NBA owners met Thursday to figure out a way to force Sterling to sell the Clippers.